Many individuals seek to have better focus and memory concentration. In many cases this is something they hope to achieve, yet do not know how or the best way to obtain it. Better memory and concentration can actually give someone a “heads up” in many situations, whether it is in the job force, school, or even personal relationships. Often memory loss can be due to aging, stress, health conditions, or other issues. Thankfully, whatever the reason, there are tips and suggestions you may want to implement in your daily routine to help improve it. 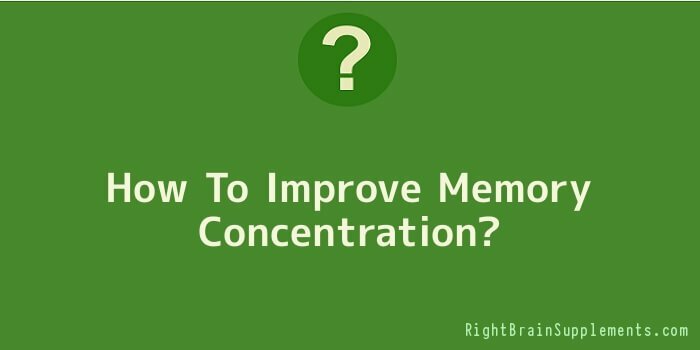 The most important tip to improve memory concentration is quite basic. Your memory is like a muscle. If you do not use a muscle, it will deteriorate and not be as strong as it once was. The same thing pertains to memory. You have to use your memory and your brain to keep it in tip top condition. There are countless ways to do this. Memorize a poem or a favourite bible scripture. Read and learn new things daily. Try and reconnect back to specific memories in the past that have made you smile. All of these will assist in helping improve your memory concentration. You may also consider doing brain puzzles, suduku, crosswords, and mathematical problems as well. These will all help keep your memory sharp too. Another suggestion to help improve your memory concentration is exercise. If you increase oxygen to the brain (which exercise does), it helps keep your memory at its best. This does not have to be anything strenuous if you don’t want it to be. Stretching, yoga, tai chi, Pilates, and others are not deemed to be strenuous exercise, but they all can increase oxygen and blood flow to the brain. It will also elevate your mood, increase your energy and blood circulation, and start you off on a great day! These are just two suggestions to help improve your memory concentration. There are in fact many others, but this can be classified as a good starting point. Remember, that this will most likely not occur overnight. With constant practice though, you are well on your way to better memory function and focus.